Exosomes are nano‐sized (30–120 nm) extracellular vesicles which are derived from endosomal compartments of eukaryotic cells. Exosomes are carriers of bioactive molecules including lipids, proteins and RNA and participate in intercellular communication. Due to their involvement in pathological conditions and their potential to be used as diagnostic and therapeutic tools, exosomes have been studied intensely in mammalian experimental systems. In contrast, knowledge about exosome composition, functions and biogenesis in lower vertebrates is scant. In the current project, we are studying exosomes released from primary salmon leukocytes. Secretion of exosomes from head kidney leukocytes is up regulated following stimulation with toll-like receptor ligands, most robustly following stimulation with CpG oligonucleotides (TLR9/21 ligand). Biochemical analyses indicate that protein composition of salmon exosomes is very similar to that of their mammalian counterparts. Salmon exosomes contain high levels of RNA - including mRNA and miRNA. The proteomic analysis indicated that these vesicles might be involved in cross-presentation. In addition to the high levels of MHC-I and II molecules, salmon leukocyte-derived exosomes are also enriched in proteins involved in processing and loading exogenous antigens onto MHC-I complexes. Secretion of exosome-like vesicles from Atlantic salmon leukocytes. Head kidney-derived leukocytes were stimulated with CpG ODNs and were examined using transmission electron microscopy. 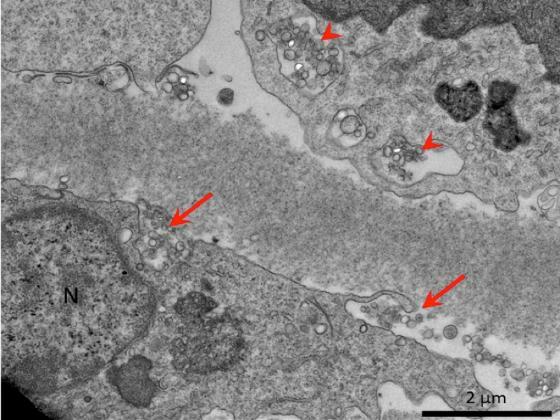 The arrows indicate exosome-like vesicles in process of secretion; arrowheads - multivesicular bodies in a neighboring cell.